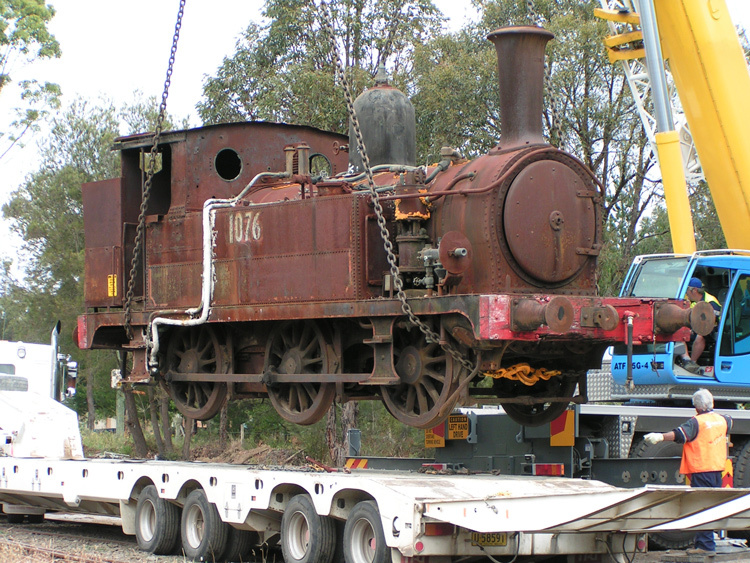 This photo is kindly provided by the RTM Exhibits Cleaning Team and shows 1076 being loaded for road transfer to Goulburn on 4 November 2008. This locomotive started life as R 288, the 4th of 6 members of the R 285 class of tank locomotives built for Sydney suburban work. It became 1804 of the Z-18 class in the 1924 renumbering scheme. In 1937 it was renumbered to 1076 (amongst the X-10 class of miscellaneous obsolete locomotives, workshop shunters and mobile cranes) when the coal bunker was removed and a small jib-arm crane fitted. 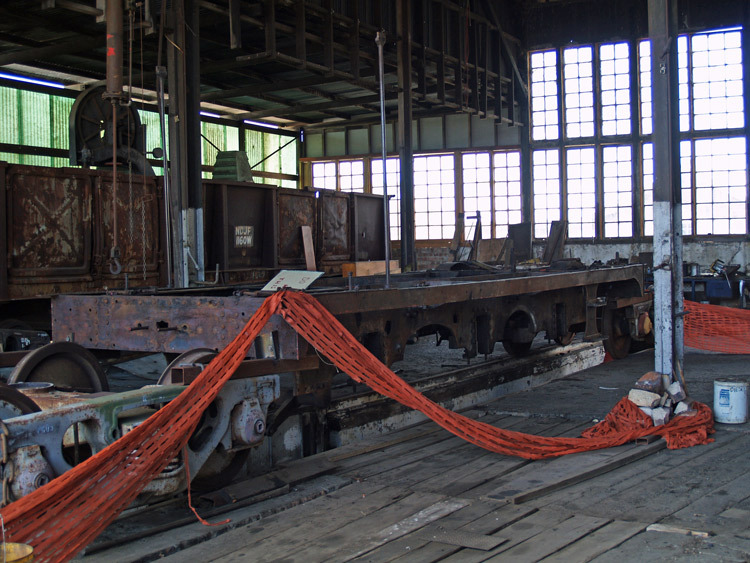 The crane was removed in 1959 and a basic welded bunker provided as a replacement, but the number 1076 remained. 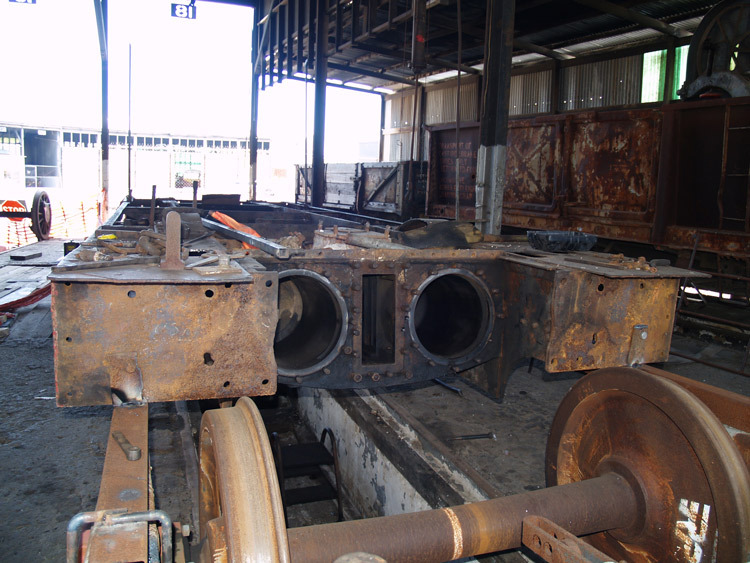 1076 received the boiler of F-351 class loco 1036 during overhaul in 1966. 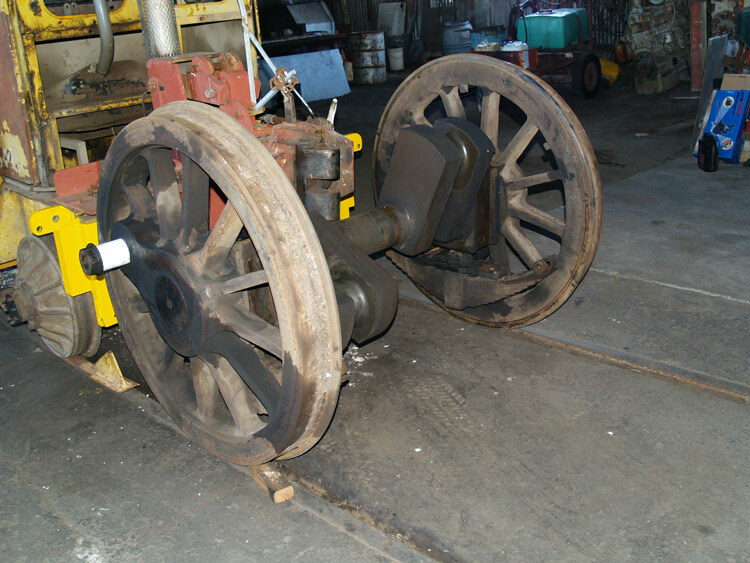 It appears the locomotive's duties included mobile steam generation for workshop use & boiler testing, as it was fitted with a live steam valve on the right front running plate, with high-pressure steam supplied directly from the dome. 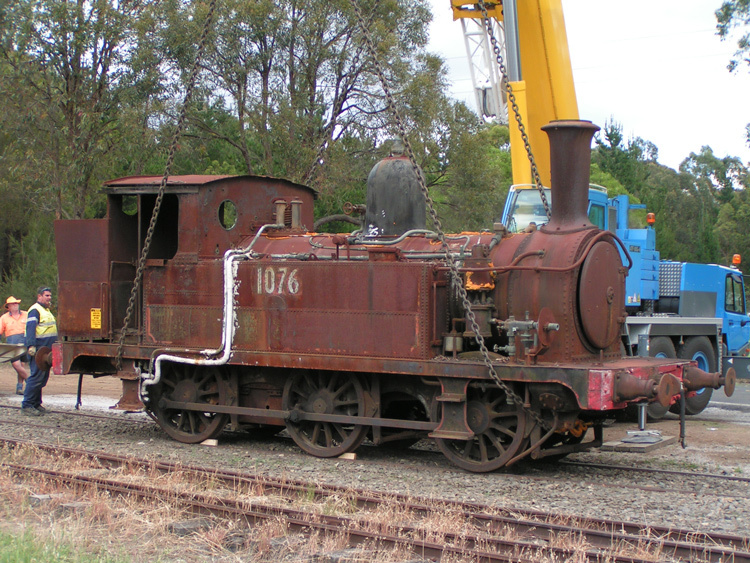 1076 was withdrawn from workshop shunting service in 1971 and later transferred to the NSWRTM. 1076 was shunted onto the long term storage sidings at the NSWRTM Thirlmere in 1983, where it subsequently remained out of public sight for 25 years. Unfortunately no restoration work was ever performed while 1076 was stored at Thirlmere, although the webmaster did give the loco a complete black-oil & lubrication in 1989 in order to slow down deterioration. 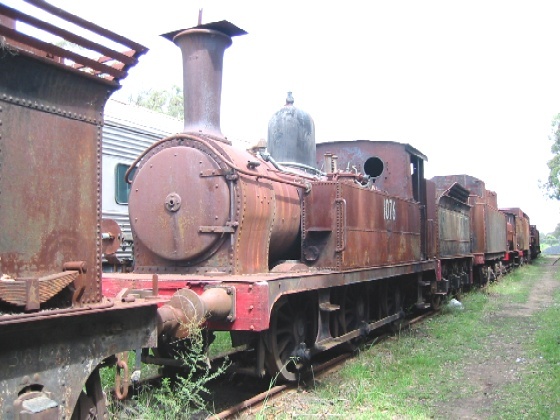 On 4 November 2008, 1076 was transferred by road to Goulburn Roundhouse for cosmetic restoration and display. The Goulburn Roundhouse is a fitting home for 1076 as it had been based at Goulburn locomotive depot around the 1950's. My visit to the Goulburn Roundhouse in January 2012 found 1076 dismantled for overhaul and restoration to operating condition. A number of photos on this page date from that visit. By May 2017 the restoration was in the final stages, with video footage showing the loco undergoing steam trials. Unfortunately I haven’t had an opportunity yet to see 1076 in steam at Goulburn, so I would appreciate the contribution of photos or video of this loco in steam. An earlier view of 1076 awaiting restoration in the long term storage sidings at NSWRTM - 17 March 2003. This second view is also kindly provided by the RTM Exhibits Cleaning Team and shows 1076 being lowered onto the road trailer - 4 November 2008. Clearly visible is the basic welded bunker and live steam valve on the running board. 1076 also retains wooden buffer beams, and the last traces of black livery with red lining can be seen. 1076's crank driving wheelset at Goulburn on 7 January 2012. 1076's front frames showing the cylinder chests. Goulburn, 7 January 2012. 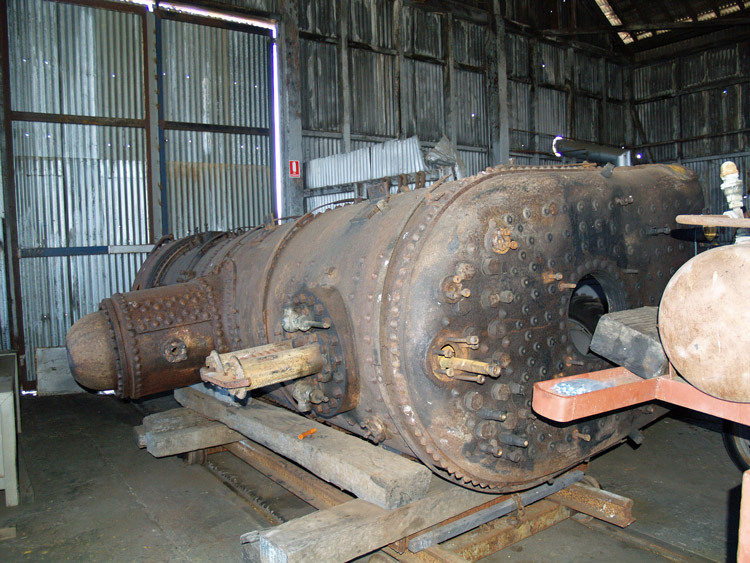 1036's old boiler (as fitted to 1076) under repair at Goulburn, 7 January 2012. Another view of 1076's frames at Goulburn on 7 January 2012.
published by J. W. Books Pty Ltd, Brookvale NSW. New South Wales Division, 1989.